We remember when retro-gaming required a lot of equipment and a serious time commitment to put together a gaming interface. [Scooter2084] proves that we’ve come a long way with this gaming controller built to complement Android hardware. It’s not immediately obvious from the image above, but the controller itself looks just like Andy the Android. His head is tilted upward and acts as the tablet stand, while his torso hosts the controls. We don’t the arms and legs have a functional use but they are necessary to complete the look. Traditionally arcade controls have used a hacked gamepad, or dedicated hardware like the MAME cabinets that use iPac control boards. 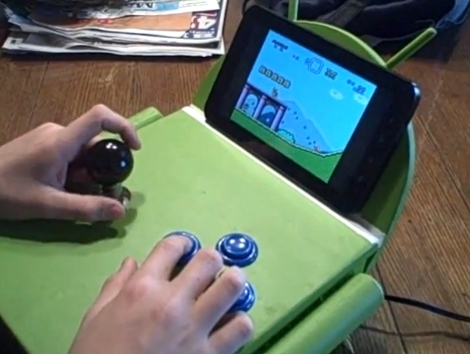 But this rendition interfaces the joystick and four buttons using an Arduino. A Bluetooth shield lets you control the Android device wirelessly, and opens up the possibility to use this as a controller for laptop-based emulators and the like. Don’t miss the video after the break. I don’t want to sound too critical, but it seems as if editors aren’t even reading over their own articles before posting them. Errors aside, looks really clean. Only thing I’d do differently is raise the eye-level so Andy’s eyes were just barely peeping over the phone. We don’t [think] you edit your posts. That is a pretty cool hack. I only recently discovered the Wiimote Control app for using a Wiimote as a controller with my Android tablet, so something like this seems great as well!